Karan and Neha's wedding at Devigarh Palace in Udaipur was a mix of colors, customized cocktails, and classy ensembles. Our series Featured Weddings brings you wonderful moments from weddings held at the finest venues across different cities. Here, we share the story of Karan and Neha's romance and wedding celebrations at Devigarh Palace, a luxury heritage resort in the Rajasthani city of Udaipur. Neha and Karan tied the knot after dating across different cities and maintaining a long-distance relationship between 2009 and 2015. Karan proposed to Neha in the historic Devigarh Palace - now a luxury heritage hotel in Rajasthan's charming city of Udaipur - in August 2014. Neha claims it was hardly a proposal as Karan simply slipped a ring in her finger and there were no questions asked or answered! Neha and Karan both wanted a strictly 'family and close friends only' wedding, so the guest count was maintained at 100. 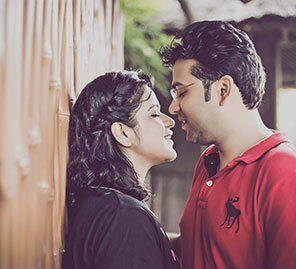 After seeing several venues in New Delhi, where the couple hail from, Karan and Neha realized that they had been missing the most obvious choice all along. So they decided to hold their two-day wedding at Devigarh Palace where Karan had proposed to Neha. 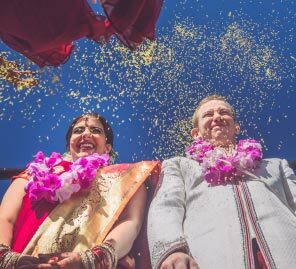 Neha and Karan realised that wedding planning was a stressful affair, and doubly so for them as Neha was attending business school in Boston, and Karan was working. It helped that both sets of parents were on the same page when it came to envisioning what their dream wedding should be like. 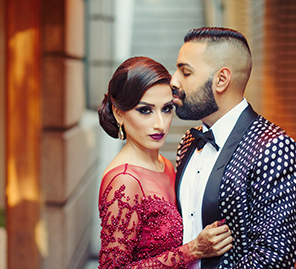 After Neha and Karan moved back to India four months before the wedding both their jobs kept them so busy that they had to hire a wedding planner. They were more than happy to outsource the tough stuff! Given how beautiful Devigarh Palace is, they did not want to overwhelm the setting with too much decor as they wanted the guests to experience the palace for what it was. The two-day wedding program included the mehndi and sangeet on the first day and the haldi ceremony and pheras on the second day. The Mehndi was held by the palace resort's poolside and a yellow and pink theme. Guests also had to come dressed in shades of yellow as that was the dress code. There were pink and yellow seating arrangements at the daytime, outdoor mehndi, from outdoor rustic beds with bright yellow mattresses with shocking pink bolsters on the stone ramparts of the palace and around the blue pool, to a massive day-bed strewn with pink embellished cushions with yellow floral garlands in the backdrop. Pink accents dangled from green trees around the property, brightening up the ancient structure in a picture-perfect way. Fairy lights added glitter to the evening sangeet in a simple yet effective way as Neha and family showed off their dance moves. There were customised 'Bride' and 'Groom' cocktails for both the events, and these drinks were named after Neha and Karan's favorite spots in Boston where they spent a large amount of time together while dating. The haldi ceremony was probably the couple's most memorable bash as everyone was relaxed, dressed casually and enjoyed splashing in the pool. Both Neha and Karan held their haldi ceremonies simultaneously as the line between their individual friends had blurred over the years so the whole gang was just like one big happy family. The outdoor, daytime wedding took place in front of the main palace which proved to be a magical setting. The 'mandap'was a minimalist yet classy setup with a fawn floral canopy. Guests could sit on divans set up neatly on the lawns, with white sheets and fawn bolsters arranged in a beautiful coordinated way. Brass ornaments were strung from trees and glinted in the sun. Neha says Karan and her style preference is to keep things understated. She shares, "We were very focused on keeping our outfits simple, comfortable and classy while also coordinating our looks. Both our styles tend to be pretty understated so that definitely was the defining feature of our choices. Over-the-top accessories and dressing is a mood-kill for us and we stuck to our instincts while selecting our designers and outfits." Neha wore a long pink skirt and glittery blouse for the mehndi, a beautiful gold gown by Shantanu & Nikhil for the sangeet, and an ornate embellished red and green lehenga with a net dupatta by Sabyasachi for the wedding. Karan wore a white kurta-churidar paired with a yellow Nehru jacket from Nine Styles, khaki Jodhpur pants and a navy blue coat with a yellow pocket square and matching buttons by Shantanu & Nikhil, and this ensemble gave him quite a princely vibe. He went with loose white trousers and an elegant fawn 'sherwani' for the daytime wedding. His bright red 'safa' added that pop of color to a simple yet striking silhouette, and he complemented Neha's designer ensemble perfectly. Neha and Karan cherish the memories of the wedding and say none of it would have been possible without their wonderful team. Neha shares, "We picked Wedding Salad to capture our wedding memories because I had seen their work online and had loved the colors and emotions they managed to capture. So picking our photographer was a relatively easy choice. And once we met Kanishka we knew we had nothing to worry about." Neha's makeup was done by Monisha. "I thought I could find a good makeup artist in Udaipur but I was wrong! I found Monisha online and set up a meeting with her as she was also based in Mumbai. Monisha is a bride's dream come true! She did a fantastic job and I liked her accommodating and easy-going nature. We met at my house to discuss the details and she was very patient and helpful," shares Neha. The couple chose Shooting Stars for their wedding videos. "We initially did not want to get a video team and hence had signed Wedding Salad for photography only. Our vendors across photo, makeup, planners and others seemed to be outnumbering the guests! A close friend kicked me out my state though and put a gun to my head to meet the video team that had covered her wedding. We loved her video and decided to bring in the video team finally. Jasvir and Deepesh of Shooting Stars insisted that we get a drone given the palace location, and what a good idea it was! The drone was an instant hit with the guests whirring up excitement and madness wherever it went. The team knows how to weave magic with their editing job. Their product is a testament to their talent," recalls Neha. Back2Culture Wedding planned the entire event, and Neha is all praises for her namesake Neha from Back2Culture. "She has oodles of patience and ran the show - from coordinating with the florists to the priest. We would have probably been driven crazy without her!" says Neha. Neha and Karan's advice for couples planning their weddings? "Don’t stress about the small stuff - it really is not worth it. Enjoy your big day to the hilt. Also, try and break from convention and add your own individuality to the special event."